3. Visit your dentist regularly, as often as is recommended. What are the health benefits of good oral health? Keeping your teeth clean and healthy combats bad breath and the buildup of plaque. Brushing your teeth twice daily, maintaining a low-in-sugar diet and regularly visiting your dentist will help reduce the risk of dental decay and gum disease, both of which can result in tooth loss. Tooth loss through dental decay and gum disease are almost entirely preventable and there’s no reason why, with a good daily oral health routine, we cannot keep our teeth for life. Another very common condition that can affect our appearance is tooth staining. Having stained teeth can make us feel self-conscious, and is caused by smoking, or drinking lots of tea, coffee or red wine. Tooth staining can be prevented by regular cleaning. Gum disease can cause bacteria from the mouth to get into the bloodstream. Thereafter it produces a protein which causes the blood to thicken, which means clots are more likely to form, and the heart fails to get the nutrients and oxygen it needs, resulting in increased risk of a heart attack. Gum disease can also cause inflammation of the blood vessels, blocking the blood supply to the brain, leading to a potential stroke. In addition, by keeping our teeth and gums healthy we are more likely to reduce our risk of certain cancers, particularly in women, as well as some forms of dementia. New research, which examined data from 65,000 post-menopausal women between the ages of 54 and 86, found those with a history of gum disease were 14% more likely to develop cancer. Of these, one in three developed breast cancer while there was also a highly-increased risk of lung cancer, oesophageal, gall bladder and skin cancers. 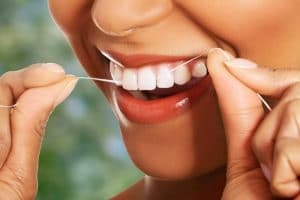 Those who have healthy gums are also 70 per cent less likely to develop Alzheimer’s disease than those who have suffered from gum disease over a long period of time. National Smile Month provides an opportunity to learn more about why a healthy smile is so important, consider your own oral health, and take steps to ensure you are following advice to maintain healthy teeth and gums.